The researchers at Hong Kong Polytechnic University have combined the Perovskite and graphene materials to make a semi-transparent solar cell capable of power conversion efficiencies around 12 percent, a significant improvement over the roughly 7-percent efficiency of traditional semi-transparent solar cells. Let's talk about these two amazing materials for those who are new to this topic. Perovskites refer to a class of earth-hued minerals first discovered in the 19th century in the Ural Mountains by Gustav Rose and named after the Russian mineralogist Lev Perovsky, which accounts for the Russian sounding name. 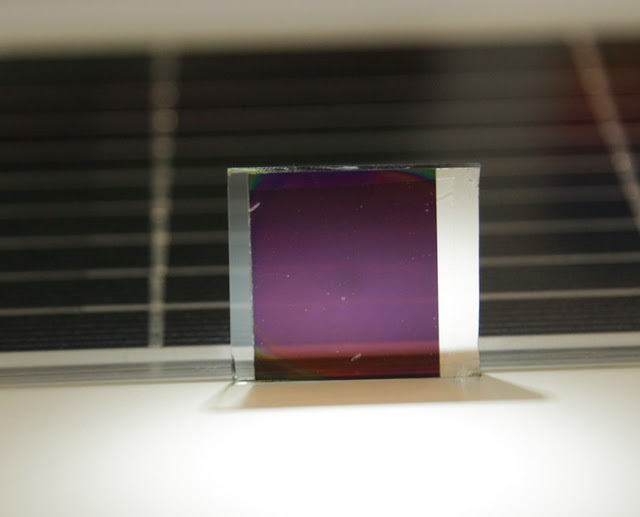 Perovskites are easily synthesized, and their distinctive crystalline structure makes them a perfect match for the development of efficient solar cells that can beat the current gold standard, which is silicon. Graphene is a nanomaterial that has been attracting a remarkable amount of interest as a potential game changer for various applications, from energy storage to flexible transparent displays. Graphene is basically a honeycomb-patterned sheet of carbon atoms. It is only as thick as one carbon atom — making it a two-dimensional material — that still manages to be 200 times stronger than steel. It is also almost entirely transparent and an excellent conductor of heat and electricity that is quite impermeable and flexible. Significant research is done towards utilizing graphene’s unique characteristics for use in solar cells. As solar cells require materials that are conductive and allow light to get through, it’s highly possible that graphene's superb conductivity and transparency might help create the next generation of more efficient, durable and low-cost photovoltaics. Developing transparent or semitransparent solar cells with high efficiency and low cost to replace the existing opaque and expensive silicon-based solar panels has become increasingly important due to the increasing demands of the building integrated photovoltaics (BIPVs) systems. 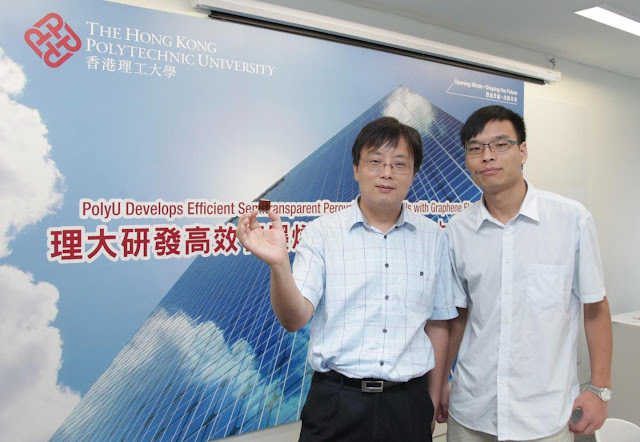 The Department of Applied Physics of The Hong Kong Polytechnic University (PolyU) has successfully developed efficient and low-cost semitransparent perovskite solar cells with graphene electrodes. The power conversion efficiencies (PCEs) of this novel invention are around 12% when they are illuminated from Fluorine-doped Tin Oxide bottom electrodes (FTO) or the graphene top electrodes, compared with 7% of conventional semitransparent solar cells. Its potential low cost of less than HK$0.5/Watt, more than 50% reduction compared with the existing cost of Silicon solar cells, will enable it to be widely used in the future. Solar energy is an important source of renewable energy, in which solar cell will be used to convert light energy directly into electricity by photovoltaic effect. The first generation crystalline silicon solar panel is highly stable with efficient energy conversion, but opaque and expensive. The second generation solar cell, namely thin film solar cell, is light in weight and can be made flexible. However, they are made of rare materials with complicated structure and need high temperature treatments.